Alexander Sokolov received his Specialist (M.Sc.) degree in Chemistry from Saint Petersburg State University (Russia) in 2009, where he worked with Prof. Olga Sizova on developing computational techniques for understanding and quantifying the strength of the chemical bonds in transition metal complexes. Alexander earned his Ph.D. in Chemistry from the University of Georgia in 2014, where he worked in the group of Prof. Henry Schaefer at the Center for Computational Quantum Chemistry. There, his research was focused on the computational studies of molecules with complex electronic structure (radicals, transition metal complexes, molecules in electronically-excited states), as well as the development of new electronic structure methods for the accurate prediction of molecular properties. In August 2014, Alexander began his postdoctoral work at Princeton University in the group of Prof. Garnet Chan, where he developed several accurate and efficient methods for the description of strong electron correlation in molecules. In July 2016, Alexander moved to California, where he continued his postdoc in the group of Prof. Garnet Chan at the California Institute of Technology. Alexander joined the Department of Chemistry and Biochemistry at the Ohio State University in August 2017 as an Assistant Professor. Research in the Sokolov group aims to develop new theoretical methods for the simulations of light-induced and non-equilibrium processes in chemical systems with complex electronic structure. Our specific focus is the development of first-principles electronic structure approaches that can efficiently describe electron correlation effects and charge/energy transfer in many (10's or even 100's) electronic states. Our group is developing new theoretical approaches that can reliably simulate spectroscopic properties of strongly correlated systems. Strong electron correlation originates due to significant mixing of degenerate (or near-degenerate) electronic configurations and is very common in chemistry. 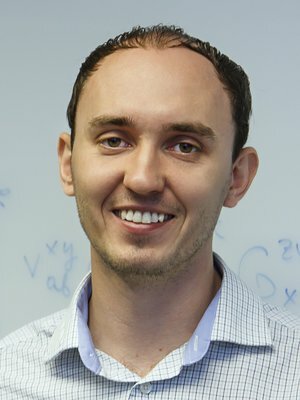 We are working on the development of methods that can reliably describe effects of strong correlation, provide direct access to important spectroscopic properties, and, yet, are computationally affordable in large systems (such as transition metal compounds). Computations of core-level excitations are very challenging as they require simulating excited states selectively in the high-energy spectral region and a balanced treatment of electron correlation, orbital relaxation, and relativistic effects, often combined with large uncontracted basis sets. We are developing new techniques that incorporate accurate description of electron correlation into efficient simulations of X-ray spectra. All methods developed in our group are implemented in Prism, a standalone open-source Python program for excited-state and spectroscopic simulations of molecules. Prism is interfaced with popular quantum chemistry packages, such as Psi4 and Pyscf. The Sokolov lab is currently looking for highly enthusiastic and motivated graduate and undergraduate students with strong interests in research in theoretical chemistry. "Simulating X-ray absorption spectra with linear-response density cumulant theory", R. Peng, A. V. Copan, and A. Yu. Sokolov, J. Phys. Chem. A. (2019). "Multi-reference algebraic diagrammatic construction theory for excited states: General formulation and first-order implementation", A. Yu. Sokolov, J. Chem. Phys. 149, 204113 (2018). "Linear-response density cumulant theory for excited electronic states", A. V. Copan and A. Yu. Sokolov, J. Chem. Theory Comput. 14, 4097 (2018). "Time-dependent N-electron valence perturbation theory with matrix product state reference wavefunctions for large active spaces and basis sets: Applications to the chromium dimer and all-trans polyenes", A. Yu. Sokolov, S. Guo, E. Ronca, and G. K.-L. Chan, J. Chem. Phys. 146, 244102 (2017). "Spin-adapted formulation and implementation of density cumulant functional theory with density-fitting approximation: Application to transition metal compounds", X. Wang, A. Yu. Sokolov, J. M. Turney, and H. F. Schaefer, J. Chem. Theory Comput. 12, 4833 (2016). "A time-dependent formulation of multi-reference perturbation theory", A. Yu. Sokolov and G. K.-L. Chan, J. Chem. Phys. 144, 064102 (2016). "Can density cumulant functional theory describe static correlation effects? ", J. W. Mullinax, A. Yu. Sokolov, and H. F. Schaefer, J. Chem. Theory Comput. 11, 2487 (2015). "A transformed framework for dynamic correlation in multireference problems", A. Yu. Sokolov and G. K.-L. Chan,J. Chem. Phys. 142, 124107 (2015). "Density cumulant functional theory from a unitary transformation: N-representability, three-particle correlation effects, and application to O4+", A. Yu. Sokolov, H. F. Schaefer, and W. Kutzelnigg, J. Chem. Phys. 141, 074111 (2014). "Orbital-optimized density cumulant functional theory", A. Yu. Sokolov, and H. F. Schaefer, J. Chem. Phys. 139, 204110 (2013). "Free cyclooctatetraene dianion: planarity, aromaticity, and theoretical challenges", A. Yu. Sokolov, D. B. Magers,J. I. Wu, W. D. Allen, P. v. R. Schleyer, and H. F. Schaefer, J. Chem. Theory Comput. 9, 4436 (2013). "Density cumulant functional theory: the DC-12 method, an improved description of the one-particle density matrix", A. Yu. Sokolov, A. C. Simmonett, and H. F. Schaefer, J. Chem. Phys. 138, 024107 (2013). "Analytic gradients for density cumulant functional theory: the DCFT-06 model", A. Yu. Sokolov, J. J. Wilke,A. C. Simmonett, and H. F. Schaefer, J. Chem. Phys. 137, 054105 (2012). "Ground and excited state properties of photoactive platinum(IV) diazido complexes: theoretical considerations", A. Yu. Sokolov, and H. F. Schaefer, Dalton Trans. 40, 7571 (2011).